I absolutely love falafel, but as I previously mentioned, I hate frying things. So when I saw a recipe for baked falafel, I knew I would have to make. It's always a gamble when you take a food that's typically eaten fried, and try your hand at making it healthier, but these falafels were a huge a success. I was really surprised at how crispy they got in the oven. I basically just read a bunch of falafel recipes and pick and choose what sounded good from each one. The recipe is pretty flexible. Feel free to add or take away spices to your liking. I threw everything in the food processor, formed them into balls, squashed them down a little bit so there would be more surface area to get crispy, then baked them at 400 degrees. It's really important to flip these half way through so both sides get crispy. Overall these were a huge hit. I served them in pitas with some chopped up cucumber, tomatoes, feta, and homemade tzatziki sauce. I also threw together a rough chopped salad with my favorite greek dressing. Enjoy! Place garlic, onion, cilantro, parsley or mint, chickpeas, and bread crumbs in the bowl of a food processor. Pulse a few times to chop and blend ingredients. Sprinkle lemon juice and olive oil over chickpea mixture and pulse a few more times. Sprinkle baking powder, salt, and spices over mixture and pulse until the chickpea mixture reaches a workable paste-like consistency. Add additional lemon juice or olive oil if it seems to dry. Preheat oven to 400 degrees F. While the oven is getting hot, line a baking pan with foil and brush with olive oil. Scoop balls (about the size of a golf ball) of dough into your palms and form them into patties. Set aside on work surface while you form the remaining mixture. Arrange falafel patties on oiled baking sheet and brush them with olive oil. Bake at 400 degrees F for about 20 - 25 minutes, until the tops are golden brown and crispy. Turn once midway through baking. 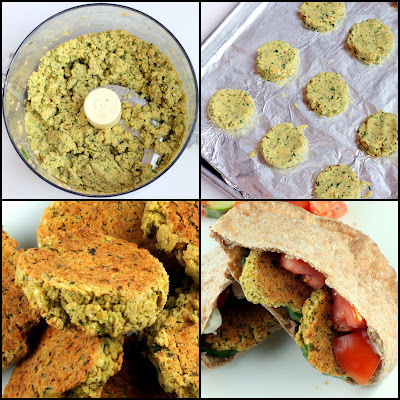 Remove from oven and let falafel cool on pan for a minute or two before removing to plates or pitas with a spatula. Sounds great. I have to try it, because I love, love, love falafel and a hate frying things to. Thanks for sharing!!!! Glad you like them! I felt the same way - couldn't stop eating them! These look amazing and I love the idea of baking not frying! I planned to make this tonight but it was too hot to turn on my oven :( I'll make it SOON though because I am craving falafel and love this healthier version! i followed this recipe and they turned out wonderfully... crispy and spicy but not greasy.